The “Play Narrated Slideshow” action is designed to present, in slideshow format, images whose references have been passed to the action as input. By default, the action displays the referenced images for the indicated number of seconds, without any background music or audio. 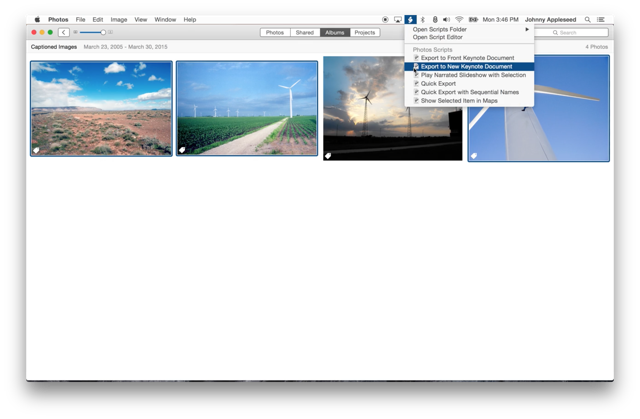 However, the “Play Narrated Slideshow” action does offer the unique ability to display each image while it speaks the description entered in Photos for the displayed media item. Each image description will be read using the system voice currently selected in the Text to Speech tab of the Dictation & Speech system preference pane. Mention of third-party websites and products is for informational purposes only and constitutes neither an endorsement nor a recommendation. PHOTOSAUTOMATION.COM assumes no responsibility with regard to the selection, performance or use of information or products found at third-party websites. PHOTOSAUTOMATION.COM provides this only as a convenience to our users. PHOTOSAUTOMATION.COM has not tested the information found on these sites and makes no representations regarding its accuracy or reliability. There are risks inherent in the use of any information or products found on the Internet, and PHOTOSAUTOMATION.COM assumes no responsibility in this regard. Please understand that a third-party site is independent from PHOTOSAUTOMATION.COM and that PHOTOSAUTOMATION.COM has no control over the content on that website. Please contact the vendor for additional information.